I have been a teacher of English for 24 years, a Headteacher for 9 years and, at the age of 48, this much I know about learning from our most experienced teachers. We ignore the skills and resources that exist in older people at our peril, says Julia Unwin, Chief Executive of the Joseph Rowntree Trust. Old School and proud of it; that’s how I describe Dave, our longest serving teacher. He’s been at Huntington 33 years since he began his teaching career in 1980. He is also Head of House. He teaches Resistant Materials in a school where nearly every student follows a Technology GCSE, the legacy of our now obsolete Technology College status. In terms of examination results at KS4 the Technology Department is our most successful, bar none, and has been for getting on for two decades. Last year’s RAISEonline is testimony to the department’s success. When I wrote how there are many long-serving teachers at our school who deliver no-frills good lessons, lesson after lesson, day after day. What they do is ingrained in their professional practice so deeply that they would struggle to explain why they are so effective. A challenge for us is to engage with these seasoned practitioners so that they can surface what it is that is special about their pedagogy; if we can do this, then those teachers can contribute to developing younger colleagues, it was Dave I had in mind. John: I am going to ask you a set of questions – is that OK? Dave: Yes fine. It is difficult to talk about me without talking about the department. John: It is about the cultural standards in your department isn’t it? Dave: I have always been really lucky from the start – I have always worked in great departments. There are no egos; everybody helps each other. If anyone does a worksheet or anything for KS4 we will all share it. We team teach and share expertise. If there is anything I am not comfortable such as with the CAD/CAM stuff – Stephen (Subject Leader) will come to me or to Suzanne (DT Teacher and Assistant Subject Leader) and we all tap into each other’s strengths. No-one is afraid to admit they need help – it works really well. John: Did Stephen sustain that? I imagine after Dave (retired Subject Leader) that would be difficult to do. Dave: I was employed as a woodwork teacher in 1980; it was my first job. John: You have been here 33 years? Dave: Yes. Dave X and Dave Y were metalwork teachers and I was a woodwork teacher and there were other woodwork teachers – and Tony who was an expert at everything – we were Jacks of all trades really. It was all much more skills based. It was different then – everyone grafted, it was about good relationships in the department. It was not as hard as it is now. Some departments aren’t really like that. We sit and have our lunch together, even it is only 10 minutes, we sit and chew the fat. We wind each other up. We work hard and have a bit of a laugh, which is part and parcel of the whole thing. We have lots of very high expectations. When Steve came it was different and what Steve has actually done – Steve has got gaps in his knowledge in terms of the technical side – but what he has brought with him is all the CAD/CAM – things that we cascade down. This works really well. He has also brought a real rigour. The way we address our KS4 kids now is very thorough. A good example of that is when we start the Controlled Assessments we tell them that we don’t accept sloppy work. We are aware of targets and things but I will not let them start on any practical work that will get them less than a grade A (Resistant Materials at Huntington attracts students from across the whole ability spectrum). They may only be capable of getting a grade C, but there must be enough in that project that they are able to access those grades. We try to create an atmosphere that kids will buy into and 95% of them will buy into what we are doing. We have some tricky kids over there, but Ben and Will bought into it for the most part. John: How do you characterise that culture that they buy into? Dave: We create a working environment which means that the rules can be slightly different. We have a lot of banter with the kids. We set boundaries with them that they know they can’t cross, but we do have a laugh. Steve and I team teach for two hours on a Tuesday morning and there is a lot of banter with the kids and they love it. If you look at the work that Ben and Will produced practically – they worked and they kept their heads down. Because you can treat them a little bit differently – it is not like teaching English or French. It is something they will engage with and get on with. This is the first year in my teaching career that we have not had a table of firewood (a separate table of [usually unfinished] wooden coursework artefacts) for the assessment. We may not get a great set of exam results this year but everyone should get C or above and that is with the grade boundaries being raised every year. The work they have produced this year is of a higher standard. In the department we have a very hard working culture. On Tuesdays for instance I will be in at 7 o’clock prepping the materials – I don’t use Tim (the DT Technician). But that is just me. I am just a bit of a control freak – I am ready an hour and a half before the lesson. We used to stay night after night getting technology finished. We don’t let kids get behind – we are rigorous. Most of our projects were finished early this year – this is because we put in really early interventions. We are rigorous with the way we do things. Steve is great – he will go round and rollock kids if necessary – he is very supportive. That is what Steve has brought to the department. John: When you look at the work scrutinies he knows each target. Steve is very targeted in his learning walks. Dave: There is a lot of experience in the department; there are also kids in the department that you don’t push too hard or they would walk away. You have to try and hit a level that works for them, that gets the most out of them without making them thinking they are working too hard. As a department we just work bloody hard – no-one falls out or anything. I am not saying it is Utopia all the time, but we get on great. John: Do you enjoy coming to work? John: Let me ask you a bit more about your teaching. How would you describe your teaching? Dave: I try to make my teaching good as often as I can. Outstanding is a difficult ask these days, but my aim is to make my lessons good. Kids come into the class and say, “Hi Sir” and they go out and say, “See you Sir” and they have worked hard in the lesson. John: In terms of your teaching, how do you plan your lessons? Dave: It depends on the type of lesson. If it is KS4 I am a meticulous list writer, the night before I will plan so I know in my head which direction the work is going. At KS4 we know the syllabus inside out – we know what will get the kids good grades. Sometimes it might seem boring, but we know what is going to get them good grades. Actually if you look at some of the (exam board) exemplar materials where they get a grade A, some of it is rubbish. We are working at a higher level of expectation, such as how well they make a door, or how well they make a drawer. We get to manage CAD/CAM and how well they get all that together really. With the KS3 we just follow the booklets. If I have one real moan it is that I have four Year 8 and four Year 9 classes for next year – it is really high input. At KS4 they are all doing different things, but at KS3 the kids are doing similar things within the theme – you don’t need to prepare it to the same level. The KS3 course ticks along quite nicely really. John: It clearly prepares them well for KS4. Dave: Yes it does but we do a lot of joint cutting practice, which is really old-fashioned, but it’s great. We give them lots of praise. I say to them that, with the mistakes they are making at the moment, they will not believe the standard they will be able to achieve by this time next year – we show them the exemplar work which we have got all over the place, which is really important. Kids like James who was a very silly boy, his drawing has come on in leaps and bounds. It is just simple and basic. I can’t say I get it right all the time. John: Your results suggest you get it right 99% of the time. 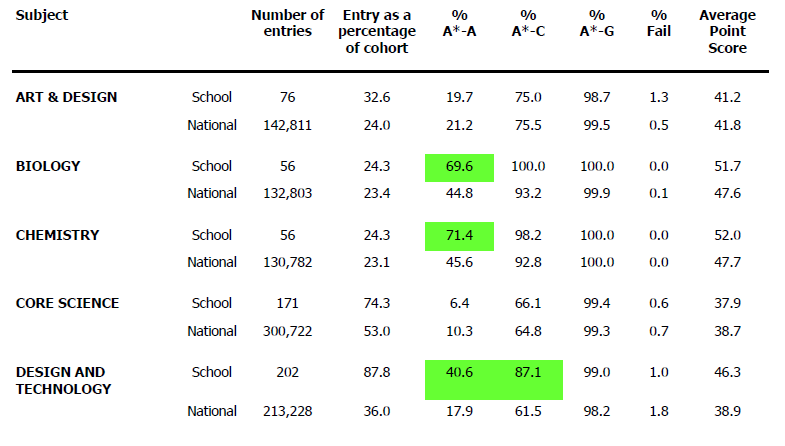 Dave: The results are based on us working bloody hard and making sure that the kids do not go down the wrong pathways. It was funny when Steve first started – they tried to make one cabinet in the shape of a whale…they didn’t go down that route again! I am quite controlling. Some people might say that I am restricting the flair that they might show, but I want them to produce something that they will really enjoy and be proud of doing. After all they have got to get the grade at the end of the day. John: They can show that flair at KS4 can’t they, in the quality of finish. It is just the tiny bits about finishing things off to get a grade A.
Dave: That’s right. Kids like Tom this year, a statemented kid, he has worked like stink. Every lesson he comes in and it is bang, bang, bang. We have had some difficult kids who have done really well. It is about creating a different atmosphere – it is a time for these kids that is important – most of them will buy into it. John: In terms of consciousness, what do you do in the way of feedback? How do you give feedback to kids? Dave: At KS4 because you are giving individual feedback at every single lesson, you are having intimate conversations with them all the time which involves “What have you done wrong here? What is your next step?” – that sort of thing. It is constant feedback – every single kid, every lesson. Part and parcel of that is saying, “This is a really tricky bit; you may be best coming after school to get it clamped up etc.” And that is all of us. At KS3, 80 to 90% of the time it is practical work, so it is verbal feedback. John: What about conscious stuff you do about literacy? Dave: I consciously do a lot more about literacy than I ever used to. There used to be an unwritten rule that you changed the spelling of technical words, etc., but now we do a lot more than that. What we don’t have in Technology is extended pieces of writing, just short answers, so it is not a difficult thing to mark. I certainly do much more than I have ever done before. John: What about prepping them for those exams? Dave: At KS4 you get the theme. Ideally we would start prepping them a little bit earlier than we have managed before. We get the theme in March and that works well for Resistant Materials. The theme this year for instance was small portable storage and art deco, so you get the kids to start researching on the internet what art deco is and what its main features are. Some of the examinations are so predictable that you can almost guess what will come up on the examination. You can actually get them off to a good start on the paper so, for example, we spent a lot of time going through art deco features and we helped them decide what small portable storage is. We looked at previous papers and at how those questions were formalised. We get them to practise doing timed sketches, so they know how long it takes to do them. By the time they have been through all of that they have enough to be able to adjust to whatever the question throws at them. Obviously without that practice with exam technique they could get behind on time. It is bang, crash, wallop – rigorous practice. Also if you put them under exam conditions they are more likely to work than if you were to send them away to research how to draw a design. Now I don’t know how our exams will go this year – I am 50/50 because it is so random. Last year we had the best examination results for written examinations. I think this was down to thorough preparation and also because we kept them in school for so long. John: What do you do to differentiate between different ability kids? Dave: At KS4, I know this sounds like an old cliché, but it is true – the work is self-differentiating. You have two aspects to the work: a design folder and the practical work. Some kids are very gifted practically, but not academically. Was David here when you were here? He was red hot on practical – you have to know what the kids can actually do. They all have targets but you just have to see what they can do. Some of Steve’s kids’ design work in Graphics this year is unbelievable. I am trying to aspire to that level this year. I think the design work I have done with my Year 10 group is the best design work I have done so far. This is what Steve has brought – we help each other. I am happy with what I have produced so far. At KS3 the work is differentiated by their outcomes – in their folders it is not like you are marking a massive piece of work – it is more short answers which are small pieces of information that they are responding to. In the past we had special folders with special language for SEN kids, but we found it wasn’t really necessary. It is by nature an intimate subject – you have to have conversations with them and you work out what they are capable of and get them to keep moving on. John: What is the best bit of training you have done in the last three years? Dave: I think it is the SOLC training (our Subject Outstanding Learning Communities, two hours every fortnight after school) when I have done a lot more work on Computer Aided Design. Two years ago I would never have imagined I would be using things like the laser cutter on a daily basis as a matter of course. We have a culture in the department where Year 8 kids can just get on the laser cutter and produce a design. I get a file out of my cupboard. There is now the 3D printer we need to sort out; I don’t know how well that is going to work. I have just done the Lego tutorial, which we have just tried as a department to get into. It is that sort of training that we are doing. My Year 10 folders are better than ever because we have got into a program called SketchUp, a 3D drawing program which is really easy to use. That has come through the training and working together in the department. John: What advice would you give to new teachers in the profession? Dave: I think teaching is a really hard job now. It is over-scrutinised and in terms of the expectations and all the observations – it is really hard. The contacts and the relationships with the kids is always the best thing. When I first started teaching I am not sure that I loved kids at that time, but now I love the day to day interaction with the kids. That is the best part of it. I see the amount of endless plans that my wife has to produce to teach at primary school and nobody ever looks at them. She should be spending that time producing fantastic lessons. My advice to young teachers would be: make sure you know what you are doing and that you enjoy the job. It is not like other jobs; you have to go that extra mile. And that is what is good about our department – everybody goes the extra mile. Your day doesn’t finish here; you are constantly on the job. It is important that you know what you are getting into. John: You can’t do it half-heartedly can you? Dave: You certainly can’t do it half-heartedly – it is not like that. That aspect has never changed. John: Thanks – that was brilliant. He’s a drop of gold! Great to read about a department that loves its work, is fastidious about quality (prep and delivery) and has the strength of mind (real professionalism) to inject what they know and share, into the sometimes over fussy requirements set by curriculum developers. And I speak as someone who has been a curriculum developer, a teacher, adviser and loads more but, when I read this it is the blacksmith in me that reacts so positively! Pls pass on my congratulations to the department. Thanks for sharing. By the way it’s an excellent example of John Hatties 6th conclusion in Visible Learning! Can I ask how much time GCSE RM gets every 2 weeks? What is wonderful about this is that it is not about ego, not about technical terms or pedagogy even. Dave comes across as a man I’d like to teach my own kids, because he clearly cares and is a damn good teacher. Thanks for sharing this Tom, you are a top man Dave! An inspiring — but also straightforward and business-like — description of high-quality teaching and what it looks like week-in, week-out. I particularly love that Dave manages to describe all this with nary a buzz-word in sight. Thank you for sharing. I really needed this today!